United Through Sport’s U15 Academy side accepted the invitation to play against a very different Academy team this week. Located on the fringes of Accra’s Central Business District, our players took to the ‘Yellow Arena’ to play the MTN Soccer Academy team. MTN is the biggest mobile phone provider in Africa. In its’ seventh season, the MTN Soccer Academy is a Big Brother style reality show where player’s performances earn public votes, and staying in the house can win you a trial with Chelsea FC. The show has discovered many talented players that have gone on to play in major European leagues and also domestically, for Glo Ghana Premier League teams such as Asante Kotoko and Hearts of Oak. The match was a fiercely competitive six aside contest. Although small sided games are a feature of most footballers training at any level, the United Through Sport boys did not have much time to adapt to the frenetic pace of the game and new format. The ‘playing for your life’ motive certainly seemed evident in the MTN players. Many of the United Through Sport Academy players have only played more a handful of matches on real grass and the wear on many of their boots gave their opponents a noticeable advantage. The MTN team started strongly, playing with panache and confidence whilst our team struggled to hold onto the ball. As our players adapted to the conditions, and seemingly took control of the game, they were soon to discover why the MTN boys are so highly rated. In the space of two minutes, two long distance thunderstrikes crashed into the top corners of the United Through Sport goal (Ahhhh! ), leaving the goalkeeper absolutely no chance with either effort. Our Academy kept their heads up and continued to play their way back into the game, well crafted moves leading to some great chances that were denied by a pair of fine saves and the woodwork respectively. Continuing to build up the pressure, our boys in red were caught by a cruel deflection to set up a counter attack to make it 3-0 to the MTN Academy. Not letting this get them down, Ibrahim Sulley, charged with leading the line for the United Through Sport Academy team, hit a quickfire brace to narrow the deficit with some fine finishing. Unfortunately, the team could not convert their chances. In between having a stonewall penalty appeal denied they conceded two more soft goals against the run of play. A half time scoreline of 5-2 was a cruel reflection of a half that could easily have gone either way. Encouraging and calming words from the United Through Sport coaches seemed to have worked, with Captain Joseph Amoah leading the team straight out of the blocks in the second period. Despite strong pressure from the visiting team, chances were not converted and lessons were not learned. Two near identical incisive counter attacks from the MTN team put the score almost out of reach at 7-2. The match had seemingly settled into a frustrating pattern whereby the United Through Sport team could not finish their chances and were clinically punished for their frailties and inexperience. Ibrahim Sulley, the saviour of the first half and the brightest attacking spark on display, added his third and then fourth of the game to bring the away team back into contention. A further fifth goal hammered in from Akwasi Anockey visibly shook their opponents as the scoreline became 7-5. To their credit, the MTN side remained resolute and their stubborn defensive efforts paid off as they kept it tight and then capitalised on a late ‘gung-ho’ approach, adding two more final goals. 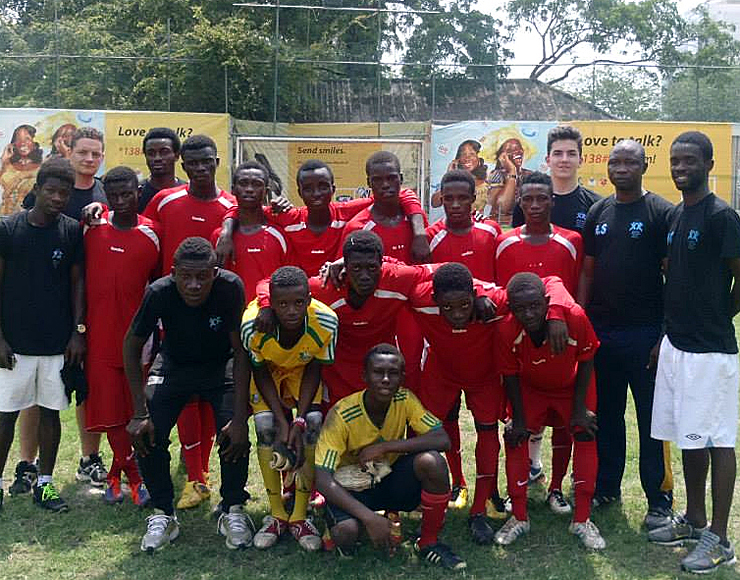 The United Through Sport Ghana Academy team has come a long way in a very short space of time. The players can be proud that they matched older and more experienced opponents in an unfamilar playing environment. Many of the opposing players may forge careers from this experience and it is the goal of United Through Sport thar our Academy players can too.